Simplicity and economics are two key reasons IT professionals are turning to hyperconverged (HCI) infrastructure for the datacenter. Datacenters have applications with a broad spectrum of needs, from medium intensity processing and storage I/O performance to high intensity processing and low-latency storage I/O performance - plus everything in between. Until now, handling this spectrum of data center requirements has challenged traditional hyperconverged solutions. With low-latency shared flash acceleration and granular, automated performance management, Pivot3 vSTAC SLX makes it possible for businesses to support a full spectrum of applications, including mission-critical, with confidence. vSTAC SLX delivers the benefits of HCI across more applications by combining the economics and manageability of HCI with the guaranteed low-latency performance of flash storage with Quality of Service (QoS) management. While other HCI solutions are limited to specific use cases, Pivot3’s QoS-managed, multi-tier flash array leverages PCIe-flash, SSD and RAM to deliver ultra-low latency performance to the applications that demand it. Pivot3’s HCI architecture is inherently unique. 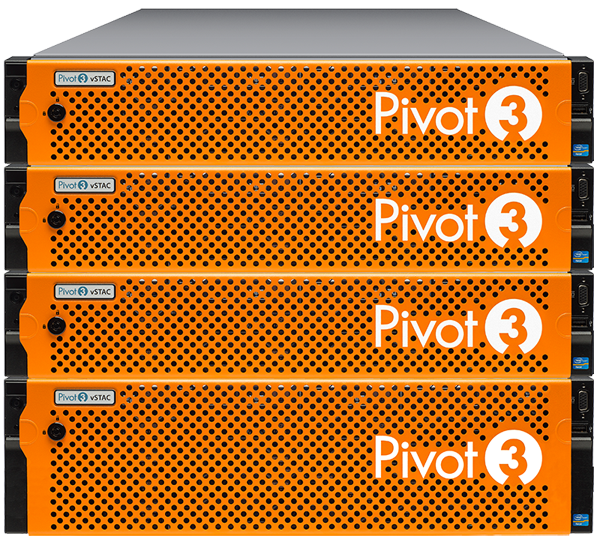 While most other hyperconverged vendors rely on resource-intensive, hardware-based replication, Pivot3 uses patented erasure coding to distribute data across all the nodes ensuring maximum performance, resiliency and storage utilization are achieved. This aggregated resource distribution for storage and compute provides increased performance and efficiency for all virtual machines, industry-leading usable storage capacity, and scales out linearly with each added node. While most HCI solutions must scale both capacity and performance when only one is needed, vSTAC SLX enables organizations to scale on their own terms. Scale-out to add performance and capacity, scale capacity only with data nodes, or scale performance with a flash acceleration tier, managed by QoS. The ability to easily assign mission critical workloads to service levels on the flash array tier enables businesses to consolidate mission critical applications to HCI with confidence. Set performance targets with policy-based Quality of Service (QoS) that governs data prioritization and automated data placement, at the granularity level that matches the way you work — from LUN/datastore down to a per-virtual machine (VM) basis with VMware Virtual Volumes (VVol) integration. Service levels and performance policies can be changed on the fly as business priorities change as well.